[UPDATE – Read our full real-world review of Sky Q] No smart home is complete without a DVR but the way we watch TV has changed so much over the last decade that some aspects of our consumption still feel mired in the past. Sky’s Director of New Products, Andrew Olson (previously COO at Comcast), joined Sky as Director of Product Planning and Design in 2012 with the responsibility of creating a new a family of products. The fruition of that project is ‘Sky Q’, the next generation system from the TV colossus. It’s the first real update since Sky+ HD was introduced a decade ago and it looks set to bring their DVR into the 21st Century. The UK’s 11 million Sky subscribers are the first to be offered the Q system. Highlights include the ability to stream recordings to TVs and tablets around your home, pause a show in one room and carry on in another, and sync recordings to your tablet to watch offline. You can stream music to them via Bluetooth 4.0 LE or AirPlay and with Digital Audio available via the HDMI or optical S/PIDF out they could form part of a whole house audio system. From £42 per month the “Sky Q” is the entry level box with 8 tuners allowing you to record 3 shows while you watch a 4th live. You can watch up to 3 different shows simultaneously – 1 x Main box 1 x Q Mini, 1 x Tablet. It has 1TB to store up to 150 hours of HD TV (around 300GB reserved by Sky for other uses). From £54 per month the “Sky Q Silver” box has 12 tuners allowing you to record 4 shows while you watch a 5th live. You can watch up to 5 different shows simultaneously – 1 x Main box, 2 x Q Minis, 2 x Tablets. It’s the only one of the boxes to support UHD when their 4K services comes on-line later this year (50fps 2160p UHD output utilising HDMI 2.0 and HDCP2.2). Its 2TB’s can store up to 350 hours of HD TV (also around 300GB reserved by Sky for other uses). It comes bundled with one of the Q Mini boxes for multiroom. The £99 Q Mini box at last brings wireless multiscreen viewing to Sky subscribers – no more running satellite cables to your bedroom. Just like the main Sky box it can show any live channel, all your recordings plus on-demand. It’s smaller (232mm x 155mm x 35mm) and is limited to 1080p output. Sky are calling the Q Mini ‘plug and play’ multiroom and it employs both Wi-Fi and Powerline AV1.1 (only compatible with other Sky devices and not enabled at launch) to send all your shows and recordings from your main box in another room in your home. Hopefully this can make streaming more reliable than wireless only systems. You can have a maximum of 2 mini’s on your Silver system (1 on the basic Sky Q box). [UPDATE] It looks like you’ll be able to have 4 minis per silver box, the restriction to 2 is only for launch while stocks are low. The new remote features a concave touchpad similar to the one found on the latest Apple TV which brings the scrolling and swiping gestures we’re all used to on our smartphones as well as clicking to select. It uses Bluetooth instead of IR so no more aiming at the box under the telly (hurrah!). There’s a dedicated Search Button to make finding your shows and recordings much easier and a voice search feature is due to be turned on in an upcoming software update. The record button now sets a series link with a single click, records a single episode with two or cancels the recording with three. If you’re always losing your remote down the back of the sofa then a press of the Q button on the front of the new box will start the remote beeping so yo can find it faster. If you are a Sky Broadband subscriber then you’ll receive the new Sky Q Hub when you order your Sky Q box. The new router also enables a feature on all your Q boxes and minis turning them into Wi-Fi hotspots (802.11ac) to extend the range and quaility of your home’s wireless network. The TV guide includes a curated ‘Top Picks’ section as well as personalised recommendations in the My Q section based on your viewing habits. This is also the place you’ll pickup from where you left off viewing in another room from Q Play feature in the ‘Continue’ menu. The more powerful search functions will let you find your next episode, whether it’s on live TV, recorded or on-demand. The new side bar allows you to use a so-far limited range of apps without interrupting your viewing. There are Sky News and Sport apps and a Photos one that can pull in pics from Facebook. The new online videos section includes YouTube and Vimeo integration as well as videos from other sources like Wired. The Sky Q App is a new application for your iOS iPad or Android tablet that allows you to stream shows and recordings around your home as well as Q Sync them for offline viewing. Many parents might recon the opportunity of silence during a long car journey is worth the price of admission alone. As ever licensing issues rear their ugly head and BBC iPlayer shows cannot be transferred to a tablet. Here’s the small print we’ve managed to find regarding this feature – “Save selected recordings from last 90 days. Content deleted from tablet 48 hours after viewing starts or no later than 30 days after syncing”. In addition, the ‘Fluid Viewing’ experience will come to even more screens with a new app for smartphones, with other devices to follow. No word yet on the options for 3rd party control for Custom Installers but surely Sky will release official protocol details for IP control and integration (and please our friends at Cornflake). Sky Q is available to order from tomorrow (9 February). Home installations begin at the end of this month and cost £50 for existing Sky customers or £99 for new ones. In addition there’s a one-off ‘Smart Features’ charge of between £99 and £299 (check out this pricing grid for details). That’s not for the hardware though as you’re just renting it and must return to Sky if you cancel your sub. Both boxes come bundled with ‘Sky Go Extra’ (normally £5 per month) which allows you to stream and download from up to 70 Sky channels over 3G/4G/Wi-Fi to 4 devices (games consoles, phones and tablets) instead of the regular 2. Sky Broadband customers will be first to receive their systems with broadband users from other providers to follow. Sky say the typical ongoing monthly cost for existing Sky+ customers will be around £12 extra, while new customers can get on board from £42. There’s no mention of Ultra HD pricing for later in the year, but if history is anything to go by there’s going to be an additional premium to pay for that too. Sky Q doesn’t replace Sky+, which is due to get an EPG update itself in the coming months which may even bring some of these new features. An entirely new level of customer service is promised for this ‘premium product’ and anyone that’s had to phone Sky in the past will tell you that can only be a good thing. For the first time ever, Sky Q customers will receive servicing and mechanical fault repairs at no extra cost. In addition, customers will have access to a dedicated premium service centre based in the UK. Watching TV is getting messy. Want to see “House of Cards’? Get a NetFlix subscription. Want to see Clarkson’s new Top Gear? Pay for Amazon Prime. It would be nice to see options to watch these services on Sky Q rather than having all these boxes hanging off your telly. Sky are keen to point out this is just the beginning for this new platform, presumably alluding to new features being added over time with software updates. So maybe we’ll see a Netflix or Amazon added in the future. They’re also trying to catchup and overtake the rival offerings from BT and Virgin and of course the streaming cable cutters friends like Roku, Apple TV, Chromecast, Fire TV etc. Many of us are locked into the Sky platform though, if you’re an F1 fan like me, or a footballist you’ve really got no other option. We’ve been longing for a new system like this since it was first rumoured and we hope to get our hands on one in the coming weeks. It’ll be easier to judge after living with it for a while. For now we can say it’s certainly premium priced, but it also looks like a premium product too. 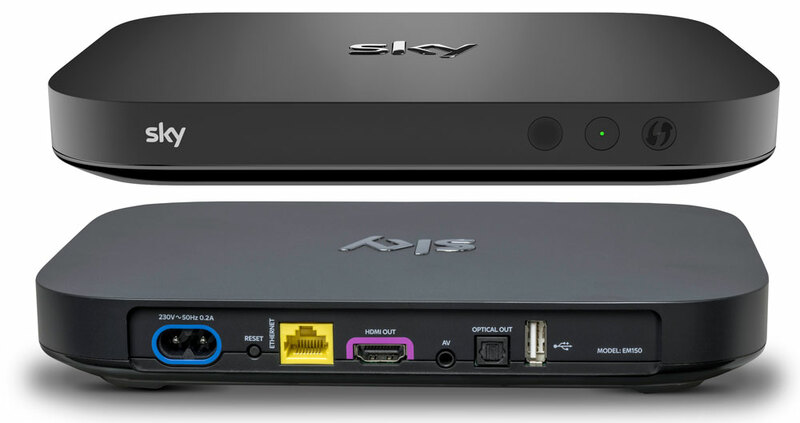 15 Comments on "New Sky Q 4K Ready DVR Brings Wireless Multiroom Plus Tablet Take Away"
Looks very interesting, but wondering how this would integrate with my existing setup for sky, which is basically an eight way amp and sky remote eyes in each room. How do I migrate this kind of setup to sky q, which as no rf output. The Sky Q mini factsheet refers to a 3.5mm jack for composite Video so perhaps an RF Modulator hanging off that could supply the house? The details say you can have additional mini boxes for more than two rooms but at extra charge. @Paul – max of 4 mini boxes – see my [UPDATE] above. @Eamon – We used to use this IR system for control round the house but now we just use IP via the Sky+ remote app. The pricing is very complicated I think too. What do the other 7 tuners do? Also, there only seem to be 2 satellite feeds which suggests, unless they’re doing something very clever at the dish end, you’d be restricted to channels from just 2 Muxes. Don’t you need 4 feeds to do the job of a multiswitch and generate unlimited feeds? The other 7 tuners are reserved for a few different things: four tuners for recording, one dedicated to the live channel, one dedicated to picture-in-picture (PIP), two dedicated to Q Mini boxes, two dedicated to Q Apps, one tuner for data such as images, and one spare reserved for future use. And how do they solve the problem of that many different tuners with only 2 cables from the satellite dish? Sky Q mini boxes are totally wireless – you can move them around to rooms you have TVs and just tune in. No more magic eyes or cabling required to watch Sky in other rooms. Just need the main box with cabling – some adjustments to connections to your Sky dish and wires to back of box – that is what I was told by Sky yesterday. Here’s some info about the proprietary AirTies mesh WiFi and Powerline network employed in the Sky Q system.